Take a rugged, tundra-like landscape greened up with lichen and moss. Lean into the wind. Brace yourself against the gale that blows over an island clad in mist and surrounded by raging seas. Add some geysers, rivers, waterfalls, glaciers and volcanos. Don’t forget to check out the lava flows. 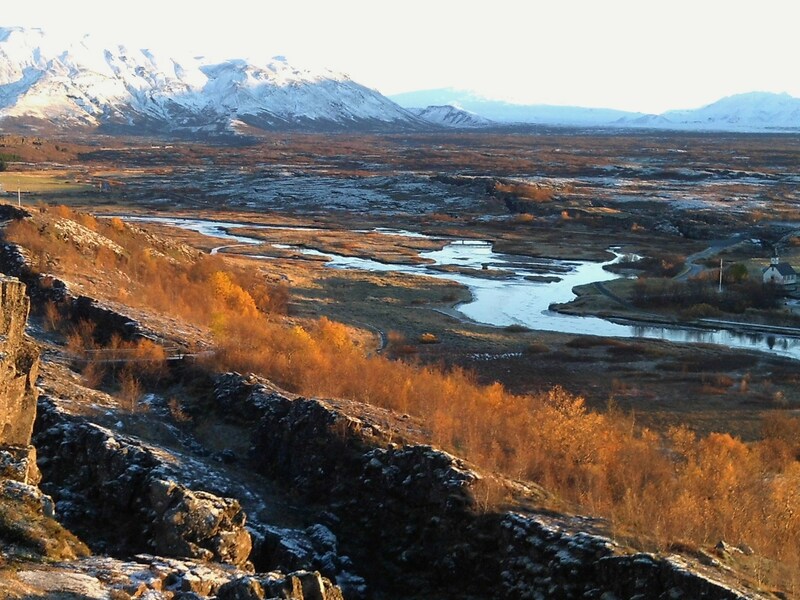 See land peppered with wild horses and sheep, and you are in Iceland. Everyone should go there. Or maybe not. My blog unfolds. Flying to Europe six or seven years ago, my husband and I stopped off in Iceland. We were enthralled and vowed to return. And last week we did return. The landscape is still breath-taking and we had a wonderful time, but the number of tourists (not yet to glut proportions but a glut-in-the-making) left us with an uneasy feeling. Flying Icelandic Air makes stopping in Iceland easy. 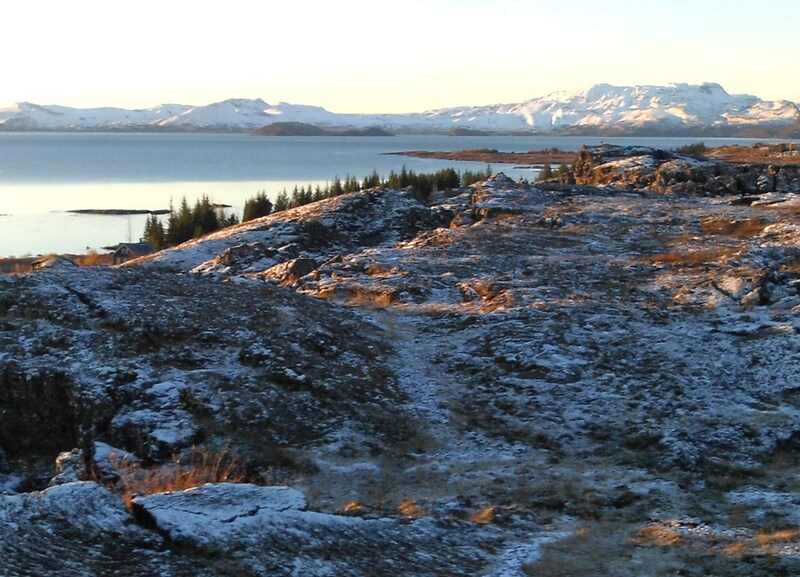 Departing from or returning to Denver, you will change planes in Reykjavik. You may have an hour layover, or… at no extra cost, you can stay in Reykjavik for one to seven days at no additional charge. It is quite the deal. However, Reykjavik is in the process of growing. All those tourists have to sleep somewhere. According to our taxi driver the city is looking to hire 5,000 construction laborers to keep up with the demand for hotels and such. The city is about to boom. Can the city planners preserve Reykjavik’s small city ambience and charm? Meanwhile, our driver was a teacher by day and a taxi driver by night. And his wife who is a nurse was working in Norway where she could make more money working three days than she could make working five shifts in Reykjavik. Inflation is rampant and the middle and lower classes are struggling to keep up. Tourist money (always funny-money: you spend on vacation and save at-home) has driven up the price of everything. No so important to the tourist who expects to spend, but a matter of life or death for the resident population. The flags in front of the church indicate the wind velocity. 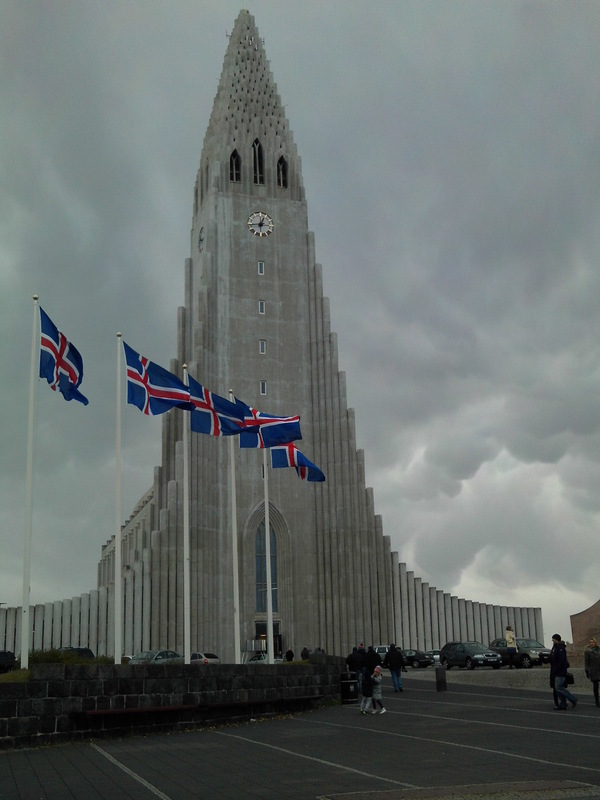 We returned to our favorite hotel, Leifur Eriksson, directly across from Hallgrimskirkja Church designed by Gudjon Samuel and built between 1945 and 1986. The massiveness of the 244-foot church is amazing. The architect wanted his design to mimic a basalt lava flow. (It looks more like an Earth-to-Mars vehicle to me, but never mind.) The inside of the Lutheran church is without decoration. Just cement – seven-story-high columns from floor to ceiling and clear glass windows. I love this stark church, so in keeping with the landscape. 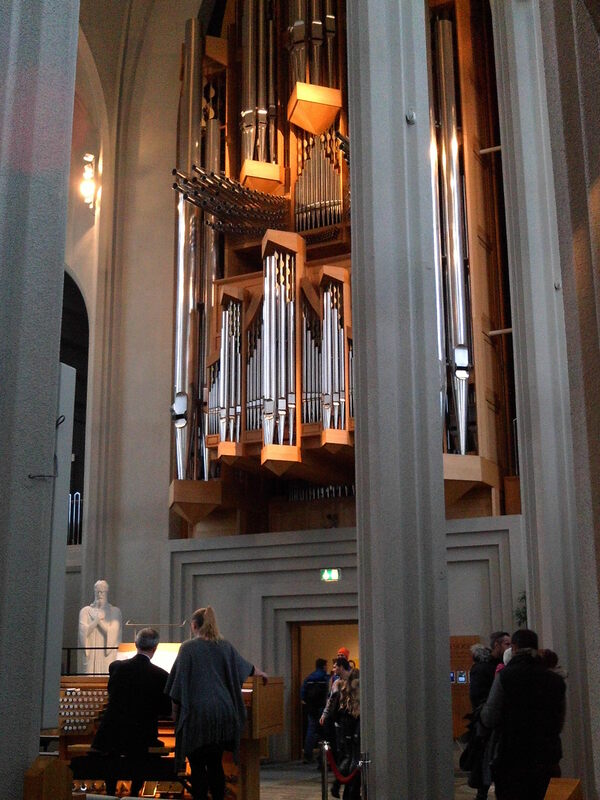 The 5,275 pipe / 25-ton organ is decoration enough. Forget that Lutheran standard, “A Mighty Fortress Is Our God.” When we were visiting, I think that the organist was playing Richard Wagner’s “Ride of the Valkyries.” The music and the volume at which it was played was enough to make you believe in Hell and fall to your knees. The only artwork is in the foyer. I am kicking myself because I took the photo but I neglected to write down the artist or the title of his work. And… I’ve researched on-line, but am no wiser as to the artist’s name. Christ on the cross is a familiar standard, but to the right on an adjacent panel, a naked man (any man… mankind) is linked to Christ by the spike through his hand. I must say my jaw dropped. A naked man in a Lutheran church!! Wow! Searching for the artist’s name, I came across a very telling article. Time being what it is, I won’t detail the piece, but if my photo of the painting intrigues you, read the NEW YORKER article at http://www.newyorker.com/books/page-turner/pope-francis-and-the-naked Christ. A statue of Leifur Eriksson (970-1020 A.D.) stands before the church. The statue was a gift from the United States – recognition that Eriksson landed on American soil in 1,000 A.D. – some years before Columbus. We took a number of day trips outside the city to visit the geysers, waterfalls and such. The landscape is wonderful, and I have come home looking for my copy of INDEPENDENT PEOPLE, by Halldor Laxness. If I remember correctly, the book won the Pulitzer Prize. A work of fiction, the book follows the hardscrabble life of an Icelandic sheep farmer in the early 20th century. I can’t remember to whom I lent my copy. Please return the book. 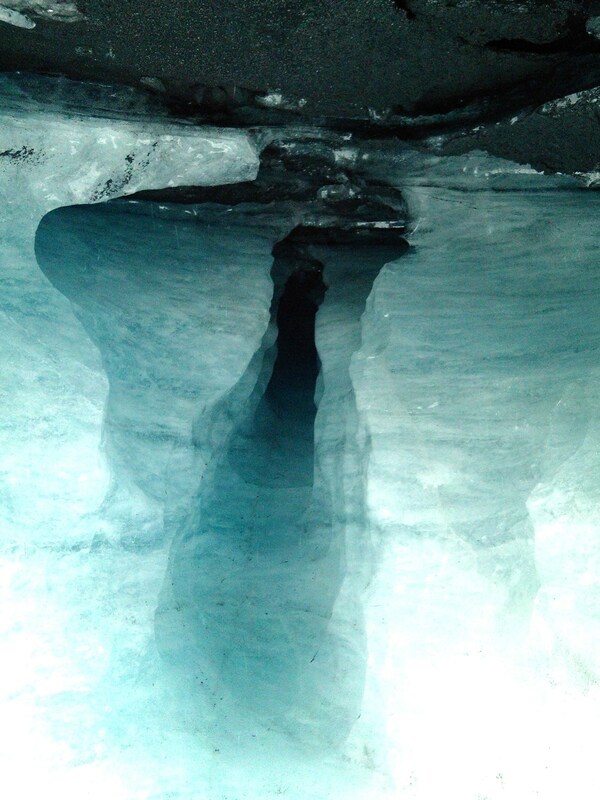 Our most exciting day was spent walking/climbing one of the glaciers. Armed with crampons and an icepick, we took off. I had expected to see gleaming white crystalized ice. 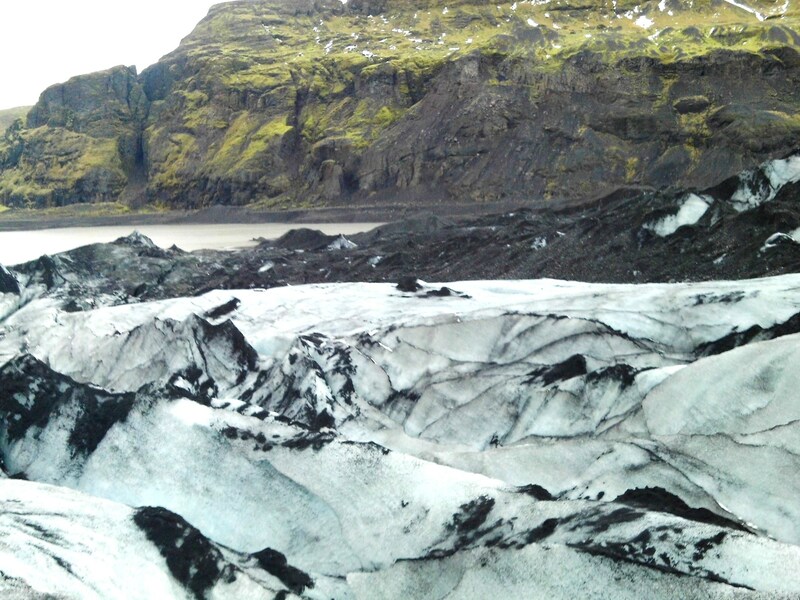 But no, the blue/white ice is dusted with volcanic ash – lightly sprinkled in some places / thick in others. Our guide looked to be the quintessential Viking. Two other guides were with our party. They all looked the same. I wondered if during the hiring process applicants had to fit a Viking profile and if that was an issue for any applicant of a more swarthy appearance. The glacier is very definitely melting. A light dusting of ash speeds up the melt; a thick coating insulates the ice and retards melting. The guide pointed out where the glacier had been over the last hundred years, and the distance between then and now was chilling. 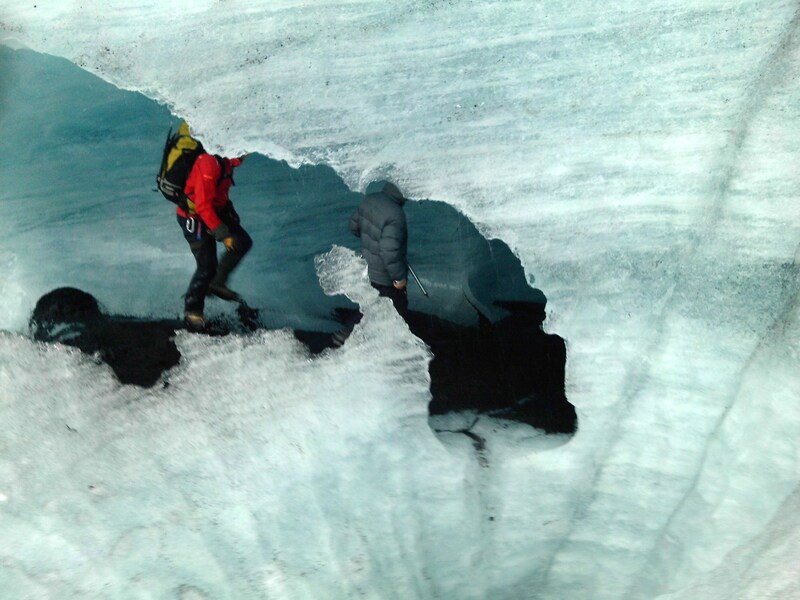 Climbing a glacier is not for the faint of heart. On my left was a fissure – a giant crack to nowhere. I saw no bottom. On my right was an endless well formed by a stone, swept along by water, caught in a crevice, and then whirled in a circle – think of a Maytag washer. As the stone circled, it enlarged and deepened the hole. Again, I saw no bottom and when the guide dropped a chunk of ice into the hole, seconds passed before we heard the splash. I am still here. I looked. You should look too. As soon as possible. 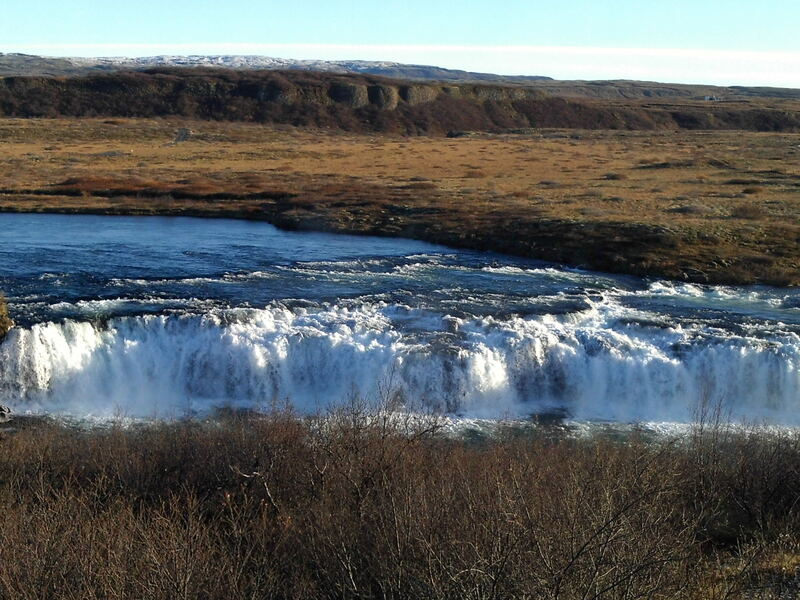 Before Iceland is undone by rampant tourism. 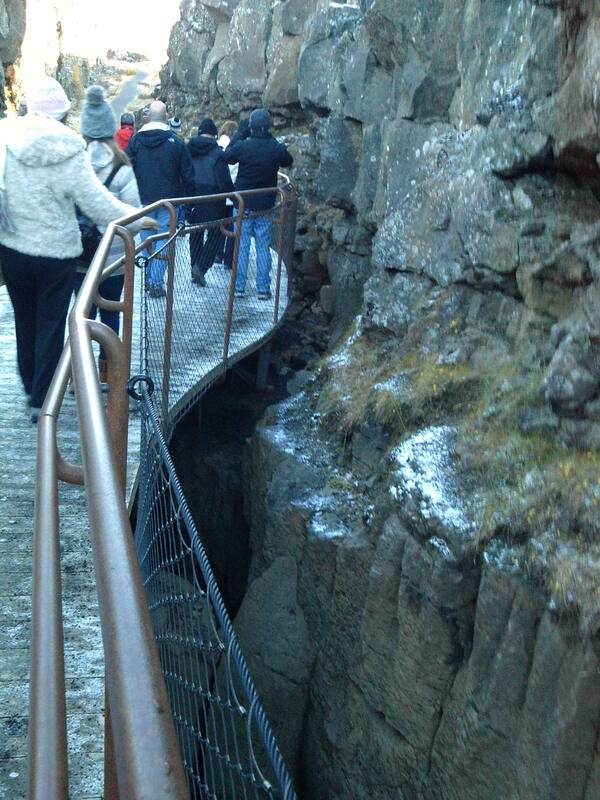 I highly recommend walking between the shifting North American and Eurasian plates. 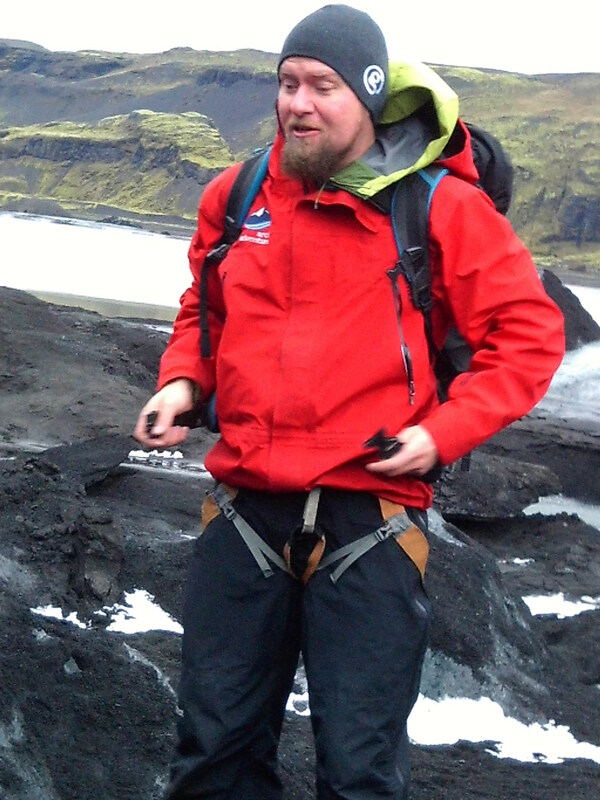 Returning to the title of this blog, I hope that Icelandic Air and Iceland’s growing tourism industry does not do away with the island’s identity. If tourism and easy money take over, Reykjavik will have killed the goose that laid the golden egg. This entry was posted in Uncategorized and tagged " Pulitzer Prize, glacial melt, global warming, Gudjon Samuel, Halldor Laxness, Hallgrimskirkja, Hotel Leifuer Eriksson, Iceland, Icelandic Air, Independent People, Reykjavik, Richard Wagner, Ride of the Valkyries, The New Yorker. Bookmark the permalink. Thank you for reading, Maria. I am sorry to keep missing Shavano Poets. Life seems to get in the way. Maybe I can make the December meeting. I have noted the assignment and will have prepared something whether or not I am able to attend. Happy Thanksgiving! On my bucket list of travels, including Prague, Indonesia and Amsterdam.